Next to the Great Oak in Chorrol, your next assignment demands the lives of an entire bloodline. Retrieve your next contract from a sack near the roots of the Great Oak tree in Chorrol. Go to Perennia Draconis' home, Applewatch, to kill her and collect a list of her children and their whereabouts. Locate and eliminate the four other family members. Proceed to the Skingrad Castle Courtyard for the next Dead Drop. The entire Draconis Family is your new target. You start this mission only knowing the location of one of the Draconis family members: the mother, Perennia Draconis. She lives all alone on her farm called Applewatch not far west of Bruma. When you arrive at her house, she asks what you are doing there. You can either tell her that you are looking for her children, and she will mistake you for a gift deliveryman, giving you a complete list of her children's whereabouts and 100 gold to buy the gifts, or you can kill her and take the list off her corpse. Be cautious however: years of living alone have left her tougher than she looks and she has a pet dog to defend her, but you shouldn't have too much trouble. If you approach her when she is sleeping, she will wake up for the conversation and then go back to sleep, allowing for an easy sneak attack. Sometimes she will be sitting in her chair reading a book. Make sure the dog isn't looking, and do a sneak attack from behind. If you kill her in one hit and the dog didn't see the attack, he will walk over then stand over her corpse and howl. From 6am to 2pm she can be found working outside, where she provides an easy kill without alerting the dog, who stays inside. Matthias Draconis lives in the Talos Plaza District of the Imperial City. His schedule provides ample opportunities to kill him. Snipe from afar: Matthias visits The Bloated Float Inn in the evening. He leaves the Inn around 9pm, so that could present a welcome opportunity to snipe him from afar. If your Sneak skill is high and you are well hidden, he might not notice you as you pelt him with arrows. If no one sees you shoot him, you will not receive a bounty. In the basement: During the day, Matthias works as a guard in the basement of the Umbacano Manor. It is possible to sneak in there and kill him with one blow, avoiding a bounty. If he catches you in the basement and you stand there for a few moments, he will attack you. If this happens, and you defend yourself, you will incur no bounty when he dies. Frenzy: While he is walking in the street near an Imperial Guard, cast a Frenzy spell on him. He'll attack the guards, resulting in his death without any bounty since you are not the direct murderer. Your next target is Caelia Draconis, captain of the Guard in Leyawiin. She patrols around town constantly. She can also be found in Castle Leyawiin, but for a certain time during the day (starting 7:30am) she is all alone guarding some rooms at the Three Sisters' Inn. Walk up to her, tell her you are going to kill her, and she will attack, (although she will alert the guards about your intentions and you will get a bounty of 1000 gold coins). Caelia, being a guard captain, is a very tough opponent and may not go down easily. If you have a decent Alchemy skill, simply make a couple of damage health poisons. Wait until there aren't any guards nearby (say, the middle of the night) and choose "Unfortunately, I need you dead." Reduce her health yourself to a low enough level that the poison can finish her off. So long as she takes the last bit of damage from the poison, you get no bounty at all, as she attacked first. Tell her you are going to kill her and then run to the Fighters or Mages Guild (if you are a member). She will follow you and get chopped to bits by your guild-mates without you so much as lifting a finger or incurring any bounty. Three Sisters Inn: If she is in the Three Sisters Inn, you can kill her without losing health by quickly going into the bedroom behind her and attacking from on top of or on the opposite side of the bed. Her sword can not reach you, so use arrows or targeted magic to quickly dispatch her. You will get a bounty. Three Sisters Inn 2: If you have high Sneak and Marksman skills, you can track her to the Three Sisters Inn late at night, break into the second floor, and sneak into a shadowed corner. She will be sitting by a table, unaware of your presence and will fall easily to a few sneaky arrows if you have hidden yourself well enough and she doesn't notice you. If she sees you, you will still get a bounty. Snipe: Wait until nightfall, follow her, and she will eventually visit the cemetery behind the Chapel of Zenithar. Then is your chance to snipe her with an arrow. However, you will get a 1000 gold bounty - even if you kill her with the first shot. You can avoid this by using a slow-acting poison. You will just receive a 40 gold bounty for assault. Frenzy: While she is sleeping in the barracks, cast a Frenzy spell on her. She'll attack the guards, resulting in her death without any bounty since you are not the direct murderer. Gray Fox: If you kill her with the Gray Cowl on, your Gray Fox persona gets the bounty instead of your normal persona. This is most easily done at her day posting in the Three Sisters Inn. Cingor: If you can sufficiently lower Cingor's disposition he will automatically attack you, if you lead him to Caelia with his health intact he is capable of finishing her in a fight, allowing you to just quickly finish off Cingor, all without a bounty. During the Fighter's Guild quest "The Hist", if she's patrolling at night and near the entrance to the Blackwood Company's door when you are told to go there, enter quickly, get the scripted greeting, then immediately exit and head towards her. She will then enter and attack, and will be quickly overpowered leading to death. Timing is key, but you won't have a bounty nor have to look for her later on. This method can be used with other characters to kill her for you at any time as she's not set as essential before this quest. The next closest target is Andreas Draconis who runs the Drunken Dragon Inn, northeast of Leyawiin. Your mother bled like a pig: Talk to Andreas and tell him that his mother "bled like a pig" or that you want him dead. He will then attack you and you can kill him without a bounty, possibly with the help of the resident Imperial Guard. If he's standing on the opposite side of the table, he won't reach you with his blows. Frenzy: Cast a Frenzy spell on him. He'll attack the Imperial Guard who is in the inn and you won't receive a bounty because you're not the direct murderer. Sneak Attack If your Sneak skill is high enough, you can walk behind the counter, behind him, and kill him while you sre hidden. Be careful, as you must do this while the guard's back is turned to make sure you don't get a bounty. The final member of the Draconis family is Sibylla Draconis who lives in Muck Valley Cavern, southwest of Cheydinhal. The cave is inhabited by leveled natural predators. Sibylla has a very high Aggression and is likely to attack on sight unless her disposition towards you is high due to high fame, infamy, and personality scores. Even if non-hostile, she has no conversation beyond the normal rumors. If this battle is overwhelming for your character, simply flee the cave. Sibylla will follow you, but her animal companions will not be able to exit the cave. Outside, your trusty steed, Shadowmere, will come to your defense and is quite capable of killing Sibylla on her own. Sibylla does not eat, so poisoned apples do not work on her. She does not sleep either, so she cannot be made to wear cursed items. After you have eliminated all the family members, proceed to the Castle Skingrad Courtyard to obtain your reward and next target. If you have previously killed Perennia, the gift list will appear on her body when you start this quest. If you wish to invest in every store, be sure to invest in Andreas Draconis' inn store before you kill him. After completing this quest and starting Following a Lead, if you visit Applewatch again and activate Perennia Draconis' Tombstone, you will be attacked by her Ghost. You will also find Caelia's sword standing against her gravestone. Here lies Sibylla Draconis. She died as she lived -- like a beast. Here lies Caelia Draconis, dedicated daughter and noble member of the Leyawiin City Watch. Killed in action. Here lies Perennia Draconis, kind and gentle matron of the Draconis family. May her spirit forever curse the murderer who stole her precious life. Here lies Andreas Draconis, dutiful son and master brewman. May he forever serve Azura in the afterlife. Collatinus Vedius is scheduled to sleep from 10 pm until 6 am, but has no bed to sleep in, making Matthias more difficult to get to than was probably intended. If you are simultaneously doing the Ahdarji's Heirloom quest for the Thieves Guild, you will have to pay the blood price after killing Sibylla, Caelia, or Matthias, despite the fact they have nothing to do with the Thieves Guild quest. 10 I have received my new orders from Lucien Lachance. I must kill every member of the Draconis family -- Perennia Draconis, Matthias Draconis, Andreas Draconis, Sibylla Draconis and Caelia Draconis. I know the location of only the family matron, Perennia Draconis, who can be found on the farm known as Applewatch. I should head to Applewatch, find out as much information as I can on the locations of the other family members, and then systematically kill them all. 15 Perennia Draconis has given me a document that lists the locations of all the members of her family. She thought I was the delivery person she hired to buy gifts for her children. I will instead use the list to find and slay each family member. I should start with Perennia herself. Then I must kill Matthias Draconis in the Talos Plaza District of the Imperial City, Andreas Draconis in the Drunken Dragon Inn, Sibylla Draconis in Muck Valley Cavern and Caelia Draconis in Castle Leyawiin. 20 I have obtained a document that lists the locations of all the Draconis family members. I must kill Matthias Draconis in the Talos Plaza District of the Imperial City, Andreas Draconis in the Drunken Dragon Inn, Sibylla Draconis in Muck Valley Cavern and Caelia Draconis in Castle Leyawiin. 30 Every member of the Draconis family has been killed. 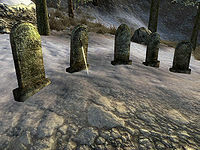 I must pick up my reward and next contract at the dead drop located in the stone well in the Castle Skingrad Courtyard. 100 Finishes quest I have picked up my reward and received my next contract. It is possible to use the console to advance through the quest by entering setstage Dark11Kin stage, where stage is the number of the stage you wish to complete. It is not possible to un-complete (i.e. go back) quest stages. See SetStage for more information. Esta página foi modificada pela última vez à(s) 10h27min de 9 de março de 2016.